Homeless People In Atlanta Plant Organic Garden, Provide Food For Shelter Residents (Huffington Post) http://huff.to/1Id3ra9 The residents have already raised small crops of lettuces, collards, ale, chard and carrots. Yoplait Yogurt Cups Have Been Killing Small Animals For Years (Huffington Post) http://huff.to/1KRhs27 Hungry critters stick their heads inside, but they can’t get them out. The Global Food War Is Escalating – Whose Side Are You On? (AlterNet) http://bit.ly/1QEYaNs Unless we move decisively as a global community to transform our degenerative food, farming and energy systems, we are doomed. Government Shutdown Would Shut Down Food Stamps (Huffington Post) http://huff.to/1NRMBVB The program helps 45 million Americans. Food Shaming Is Out, Funny Looking Vegetables Are In (AlterNet) http://bit.ly/1LFhQBt Delicious, high-end cuisine made from crooked veggies and discarded food? Yes please. Another EU Nation Has Banned Planting GMO Crops (takepart) http://bit.ly/1j4rQJt Northern Ireland has followed Scotland in saying that genetically engineered varieties cannot be grown in the country. Women Are the Key to Bringing Sustainability to the Corn Belt (takepart) http://bit.ly/1gu3F4Y Much of the farmland in the Midwest is under female ownership – and conservationists are hoping that could have long-term benefits. 5 Ways to Guarantee a Successful WWOOFing Experience (AlterNet) http://bit.ly/1JaE73O So you want to volunteer on an organic farm? Here are tips to make sure you get the experience you want. What Exactly Is The Microwave Doing To Your Food? Here’s The Science (Huffington Post) http://huff.to/1F8Mli2 Don’t worry, scientists say microwaved food can be just as nutritious as conventionally cooked food. World’s Best Restaurant Is Betting the Farm on Its Future (takepart) http://bit.ly/1V50mVc Copenhagen’s Noma will close after New Year’s Eve 2016 and reopen with a new focus on growing its own ingredients. What if One Farm Raised (Almost) Everything You Ate? (Civil Eats) http://bit.ly/1Ks1paD Whole-diet CSAs are stretching the limit of the farm-to-consumer relationship, while providing community and convenience in rural America. Chiles: Good for Cooking, Good for Studying Climate Change (takepart) http://bit.ly/1PhIW0t Native to Mexico, the spicy crop is grown and enjoyed throughout the world. Why Food Belongs in Our discussions of Race (Civil Eats) http://bit.ly/1Obtx4m While the Black Lives Matters movement works to put a stop to police violence, another less-visible form of structural violence is taking place across America. 5 Things to Know About the Congressional Battle Over School Food (Civil Eats) http://bit.ly/1L0enc6 Kids are finally getting more whole grains and vegetables at school. But the healthier rules are at risk as Congress debates Child Nutrition Reauthorization. Sexually Abused Farmworkers Get Their Day in Court – and Win (takepart) http://bit.ly/1OJyEbf Here’s another egregious example of why we need better labor protections for US farmworkers. 10 Cities Where It’s Most Terrifying To Scrape By On Minimum Wage (Huffington Post) http://huff.to/1ObptkH Workers making minimum wage in New York have had it easy, at least compared with these counties. How Cities Can Join the Fight Against Wage Theft (Equal Voice For America’s Families) http://bit.ly/1NBxY8w A group from the Texas-based Fuerza del Valle Workers’ Center, which battles wage theft, is asking local elected leaders to step up, take action and fight poverty. Annie’s Now Makes Vegan Mac and Cheese (Huffington Post) http://huff.to/1FUxaE5 It’s formulated with pumpkin and sweet potato powders. There Are 45 Fracked Wells Within 2 Miles of My Daughters School (AlterNet) http://bit.ly/1KkaTUf I believe California is illegally discriminating against students of color by permitting wells that are disproportionately close to the schools they attend. Can This Genius Strategy Stop Big Ag from Dumping Fertilizer Into Drinking Water? (Mother Jones) http://bit.ly/1EDrl2w One Iowa utility is sick of sky-high nitrate levels in tap water – so it’s taking action. Why America’s Deadly Love Affair with Bottled Water Has to Stop (AlterNet) http://bit.ly/1Kr7Y9b Last year, Americans drank more than 10 billion gallons of bottled water. Wildlife and the environment paid. Snowpack In Sierra Nevada At 500 – Year Low (Huffington Post) http://huff.to/1Fb1tv6 An “ominous sign of the severity of this drought,” researchers said. Amazing New Process Treats Wastewater, Captures Carbon and Makes Renewable Energy (AlterNet) http://bit.ly/1gXFQ68 An electrochemical reaction that absorbs more C02 than it releases while creating renewable energy could transform emission-heavy industries. Pacific Ocean warming 15 time faster than before (USA Today) http://usat.ly/1JvOBAD Some parts of the Pacific Ocean have warmed 15 times faster in the last 60 years than they did during the previous 10,000 years. Move Over Test-Tube Burger, There’s a Lab-Grown Chicken Breast in the Works (Civil Eats) http://bit.ly/1M6kpe3 The research is still in its infancy, but an Israeli scientist hopes to bring this animal-free meat to the masses. DNA Sequencing Reveals Food’s Secrets – but Consumers May Not Learn What’s Uncovered (takepart) http://bit.ly/1LH9OUf Clear Lab’s new analysis service can test the complete makeup of a product, including unintended ingredients and pathogens, with one test. Honey Bees Win One Battle with EPA, But the War Against Pesticides Continues (AlterNet) http://bit.ly/1ikNqZl Sulfoxaflor has been linked to the mass die-off of honeybees. Chicken Disneyland (Other Words) http://bit.ly/1j08PYr McDonald’s is slowly transitioning to cage-free eggs, but that’s only slightly better deal for the chickens. More Superbugs? Despite Warnings, Farm Antibiotic Use Is Rising Worldwide (takepart) http://bit.ly/1iHAmy5 The expanding global middle class wants to eat more cheap meat. The Shocking Amount of Fast Food Kids Eat Every Day (takepart) http://bit.ly/1LHbblV A new report reveals that the numbers have held steady since the 1990’s. Food is Free in a City Near You (Civil Eats) http://bit.ly/1Q1vXjE From Austin to Iowa City, a new kind of sharable community garden is springing up. Former Black Panther Launches Oakland Urban Farm to Give ex-Prisoners a Fresh Start (Civil Eats) http://bit.ly/1g98H6T Veteran activist Elaine Brown has hatched a plan that begins with a farm, and could bring about a renaissance in an under resourced neighborhood. In Southern California, Oil and Farming Don’t Mix (Civil Eats) http://bit.ly/1Fzk9PS How a small farm survived an oil disaster with some faith and a little help from friends. We Tell Ourselves Stories to Lean to Eat Bugs (takepart) http://bit.ly/1KiklbK Researchers are hoping to create a cultural context for eating insects and, in turn, helping to save the environment. Why is a Paris suburb scrapping an urban farm to build a car park? (The Guardian) http://bit.ly/1FBfQDH With the UN climate conference putting Paris in the eco-spotlight this year, the impending closure of R-Urban, a project at the forefront of urban sustainability, seems curious – not least in its timing. They Want to Pave This Urban Farm and Put Up a Parking Lot (takepart) http://bit.ly/1Nw48SY A Paris suburb’s R-Urban project was hailed as an innovative way to bring fresh food to the community. With Effort, the Northeast Is Once Again Becoming a Breadbasket (Edible Manhattan) http://bit.ly/1K4ofS4 Amid the modern wheat-related gloom and doom, a small group of true believers have been working diligently to reconfigure our relationship with wheat. Rate Of US ‘Food Insecurity’ Stubbornly High (Huffington Post) http://huff.to/1UCKLff Despite an improving economy, many Americans struggle to get enough good food. Big Data Helps Show a Different Face of Hunger in America (takepart) http://bit.ly/1XTWIwe Mapping food insecurity in Washington, DC, could change the way food banks serve those in need. Your Next Cup of Tea Could Be Supporting Child Slavery (takepart) http://bit.ly/1VUAY1k An investigation from BBC News is just the latest to reveal the human rights violations happening in Assam, India. Chipotle’s Sustainable Pork Producer Just Sold Out to Big Ag – but Maybe That’s a Good Thing? (takepart) http://bit.ly/1EUJx8g Perdue Farms, a leading poultry producer, is buying pioneering meat company Niman Ranch. What the Sale of Niman Ranch Could Mean for Farmers (Civil Eats) http://bit.ly/1geBuHi With further consolidation in the meat market, some experts worry about the watering down of a once truly sustainable brand. Composting in New York City Just Got Easier (takepart) http://bit.ly/1iFHQ4c By recycling food scraps and other organic waste, New Yorkers are fertilizing local businesses and reducing the city’s carbon footprint. Killing the Colorado (ProPublica) http://bit.ly/1iI0qc5 The river that sustains 40 million Americans is dying – and man, not nature, is to blame. Here’s What I Saw in California Town Without Running Water (Mother Jones) http://bit.ly/1it6KnF Thanks to the drought, many people in East Porterville can’t cook, shower, or flush the toilet at home. First Soda, Now Salt: New York City Slaps Warning Labels on Restaurant Menus (takepart) http://bit.ly/1NwkLhh Gotham’s board of health is cracking down on sodium-packed meals from chain eateries. Bees Have Their Day in Court – and Win Big (takepart) http://bit.ly/1imh1lT A federal appeals court overturns the government’s approval of a powerful new pesticide linked to pollinator deaths. Beyond Kombucha: The Fizzy, Healthy World of Fermented Drinks (takepart) http://bit.ly/1XXwNUf Probiotic-packed beverages are popping up all over the place. The Biggest Cause of Death Around the World Is Something We Can Fix (takepart) http://bit.ly/1FEmedm An analysis of 23 years of data from 188 countries reveals the top killers of people across the globe. Farms Without Wildlife Don’t Produce Safer Food, Study Finds (Civil Eats) http://bit.ly/1KfCnY9 Sterile monocropping does not result in fewer pathogens in produce, say researchers at the University of California. Some think of the tomato as a fruit and others think of it as a vegetable, but one thing is certain with this “produce-fluid” plant is that it is packed to the max with nutrition. The tomato has been referred to as a “functional food”–meaning it goes beyond basic health benefits and is part of a group of food that can actually prevent chronic disease. Nutrients found in tomatoes can help with sleep, muscle movement, learning and memory. 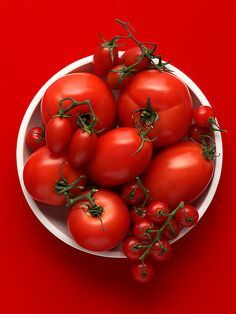 Choline is abundant in tomatoes, and can also help maintain the structure of cellular membranes, aids in the transmission of nerve impulses, assists in the absorption of fat and reduces chronic inflammation. The tomato is very popular around the world, and is so versatile that it comes in over a thousand different varieties that vary in shape, size, and colour. 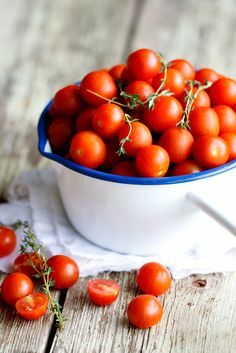 There are small cherry tomatoes, bright yellow tomatoes, Italian pear-shaped tomatoes, and the green tomato, famous for its fried preparation in Southern American cuisine. Tomatoes are fruits in a botanical sense, but they don’t have the dessert quality sweetness of other fruits. Instead they have a subtle sweetness that is complemented by a slightly bitter and acidic taste, that is why they are often prepared and served like other vegetables. Farmers produce close to a million metric tons of tomatoes in Canada every year. Agriculture and Agri-Food Canada, have added scientists to their team to find better ways to grow tomatoes in the field or greenhouse. Tomatoes can be easily incorporated into your daily diet by using them in sauces and soups. Add a slice to your sandwich or wrap. Or to rice and beans, quesadillas or tacos. My favourite is adding them to your omelets or scrambles for breakfast. Check out our Produce of the Week Pinterest board for more recipe ideas, gardening tips and fun tidbits! Yes, the Local, Sustainable Fruits and Vegetables You Buy Do Taste Better (takepart) http://bit.ly/1UqwqCr Knowing that foods are produced ethically creates a perception of better taste, according to a new study. One of the World’s Biggest Food Companies Is Getting Serious About Cutting Emissions (takepart) http://bit.ly/1igDdNS General Mills announces a plan to reduce the amount of greenhouse gases it generates by nearly a third over the next decade. “You Fly to the Edge of the Tar Sands, and… No Life”: A Montana Professor on the Issue of Our Time (Yes!) http://bit.ly/1JWLbWS University of Montana professor George Price on permaculture, race, and how he’s standing up to tar sands extraction. Jim Hightower: Have Your Coke and Guzzle It Too (Other Words) http://bit.ly/1XvkIp5 The world’s largest purveyor of sugary sodas now peddles empty-calorie science too. The Labor Ruling McDonald’s Has Been Dreading Just Became A Reality (Huffington Post) http://huff.to/1LEhMTu The fast-food giants are not going to be happy. Next Year, Breaking Off a Piece of This Candy Bar Won’t Involve Child Labor (takepart) http://bit.ly/1Nan89n Nestlé is cleaning up the supply chain for one of its iconic chocolate brands – but there’s still a lot of room for improvement. Robert Reich: In the New Economy, Workers Take on All the Risk (AlterNet) http://bit.ly/1LBXVUR More Americans than ever don’t know what they’ll be earning next week. That’s why we need income insurance. Monsanto’s Bid Become A Pesticide Giant Is, Thankfully, Dead (Huffington Post) http://huff.to/1Jk4FRp A merger with rival Syngenta could have created a monster. McD’s Wants You to Know About All-Day Breakfast – but Not It’s Switch to Real Butter (takepart) http://bit.ly/1hFijr7 The fast-food giant once again is struggling to catch up to consumer taste. The Number of Americans Living on Less Than $2 a Day Is Skyrocketing (AlterNet) http://bit.ly/1ECtOKQ Research shows 1.5 million households and 3 million children are living in desperate economic conditions. Farmers Stage 1,000 – Strong Tractor Protest In Paris (Huffington Post) http://huff.to/1PNq3Cq The farmers are seeking tax breaks from the French government and EU action to level the playing field with neighboring countries. Can’t Get Blood From a Stone, but You Can Make Water out of Food Waste (takepart) http://bit.ly/1POEDd3 Researchers at Miami University have figured out a way to get some of the wasted resources back from trashed fruits and vegetables. Here’s How 180,000 Tons of Food Waste Will Skip the Landfill (takepart) http://bit.ly/1JFtyJN An anaerobic digester facility will help reduce the amount of refuse that’s piling up in garbage dumps on the New York metropolitan area. Too Warm, Too Few Fish: Health Warning for World’s Oceans (AlterNet) http://bit.ly/1hgjTQb Rampant overfishing combined with the impact of climate change is seriously endangering the well-being of the oceans. Chipotle Slapped With Lawsuit for Allegedly False GMO-Free Claims (truthout) http://bit.ly/1LOZFre The first chain restaurant to declare its menu free of genetically engineered ingredients still serves items that are either made with or raised on modified crops. Pesticides Blamed for Bee Declines Widespread in US Waterways (AlterNet) http://bit.ly/1PzjQKg Expert says neonicotinoids, even at EPA’s ‘safe’ levels, could devastate aquatic invertebrates. Why the Era of Cruel Extreme Confinement of Animals Raised for Food Appears to Be Coming to an End (AlterNet) http://bit.ly/1hSHIym All the key players in the industry are moving to adopt more humane approaches. Bird Flu Is Changing the Egg-Shopping Game (takepart) http://bit.ly/1JRCc9i Prices are still high following the devastation brought to the poultry industry earlier in the year. There Is Poop in Basically All Hamburger Meat (Mother Jones) http://bit.ly/1Jrw8Qu But there’s less bacteria – and way fewer antibiotic-resistant strains – in grass-fed beef than conventional, consumer Reports finds. Why You Really Might Want to Go with Having a Veggie Burger Instead (AlterNet) http://bit.ly/1LBXCcE Antibiotic-resistant supberbugs found lurking in 1 in 5 conventional ground beef samples. Why It’s Getting to Be Damn Near Impossible to Know What Food Is Actually Healthy (AlterNet) http://bit.ly/1PzjnYs Corporate funding is producing oceans of questionable information when it comes to health.